Tremendous Pharmaceutical Profits or Totally Protected Plunder? Here’s a piece I did for CIP-Americas Program in Mexico City on the Trans-Pacific Partnership. The next round of negotiations will take place in Lima, Peru, and proponents are pushing for a final agreement by fall. But the language of TPP promoters rings hollow for those who have tracked the progress of other trade agreements, like NAFTA. “They’re saying that it’s going to open up opportunities for exporting more Mexican goods to other countries, like to Asia… That Mexico will become more competitive in other markets,” said Manuel Pérez-Rocha, associate fellow at the Institute for Policy Studies, and member of the Mexican Action Network on Free Trade (RMALC). Pérez-Rocha pointed out there’s little concrete evidence that Mexican exports to Asia will increase as an outcome of the agreement. “Mexico has actually signed many Free Trade Agreements with other countries, and its dependency to the US market hasn’t changed a bit,” he told the Americas Program.Since the US got on board, the TPP has taken shape as a second generation of geographically-distributed multilateral negotiations after the collapse of the World Trade Organization (WTO) talks and the Free Trade Area of the Americas proposal. According to the Office of the US Trade Representative, “This agreement will advance U.S. economic interests with some of the fastest-growing economies in the world; expand U.S. exports, which are critical to the creation and retention of jobs in the United States; and serve as a potential platform for economic integration across the Asia-Pacific region.” During the negotiations, concerns have been raised that the TPP will limit access to generic medications, impact Internet access, and affect local markets for textiles, shoes, milk, and grains in negotiating countries. “[The TPP] is a way to isolate China, it’s a way to do an end run around the WTO and to kind of pursue the US agenda, which was not getting very far with countries that are willing to participate… it’s just an expansion of the general free trade architecture that was being contested to some extent,” said Stuart Trew, trade campaigner with the Council of Canadians. With the TPP, secrecy is the name of the game. So far, “there’s been no text released, the only text that’s come out is through leaks,” said Trew. 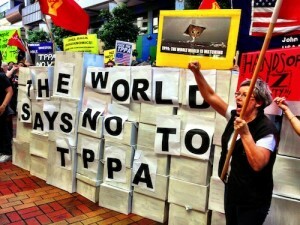 The fact that the TPP is being negotiated between countries that have already signed various Free Trade Agreements (FTAs) and multilateral trade agreements has shifted the nature of the concerns among activists in negotiating countries away from strictly market based concerns and towards issues of Intellectual Property (IP) and investment protection. Intellectual Property (IP) represents another area where the US is pursuing an aggressive agenda in TPP negotiations. IP is similarly a major concern in Peru and in Canada. “In the case of the TPP in Peru, for example, it’s not just another agreement with countries with which we already have [Free Trade Agreements], the threats go beyond commercial exchange strictly speaking… They’re more in the area of deepening institutional reforms in sensitive sectors like intellectual property,” Alejandra Alayza, executive coordinator of the Peruvian Network for Globalization with Equity (redGE Perú), told the Americas Program from her office in Lima. Pharmaceutical drugs and the IP chapter in the TPP could also have an impact on the availability of generic drugs of other negotiating countries, including Canada, according to Trew, who says drug prices in Canada will likely rise if the TPP is passed. “Proposed by U.S. negotiators, the IP rules enhance patent and data protections for pharmaceutical companies, dismantle public health safeguards enshrined in international law, and obstruct price-lowering generic competition for medicines,” reads a statement released last month by Doctors Without Borders (MSF). The stakes are a little different in Mexico, which has an economy that is much more dependent on the US than the other Latin American nations involved. If anything, the TPP will deepen Mexico’s dependence, according to IPS’s Pérez-Rocha. In addition to the textile and shoemaking sectors, Pérez-Rocha pointed out that Mexico’s milk, coffee and basic grains sectors could all be negatively impacted through the passage of the TPP. Canada’s dairy sector could also take a hit if the TPP is passed. “Really its just another race to the bottom, but no one wants to get left out, no one wants their economy to be somehow damaged if they’re not part of the negotiations,” said Trew. Though Alayza said she isn’t expecting mass mobilizations in Peru during TPP negotiations there, events are being organized in Peru and elsewhere to coincide with the talks. The TPPxBorder group has started compiling a list of events being organized against the TPP, beginning with a day of action on May 11th. Dawn Paley is a freelance journalist and independent researcher. See more of her work online at dawnpaley.ca.